It was during November of 2016 that I started working on Mis Raíces, a photography project focused on my journey exploring my Puerto Rican roots. I spent the first 7 months of this year rekindling my love for my culture after not visiting my family on the island for close to 14 years. Between January and June I had visited twice, for a total of 3 weeks. I put together a 20 piece collection and was honored to have it on display at the Villa Victoria Center for the Arts for the month of September. It was magical being able to decorate the walls of the gallery with images of Puerto Rico's beautiful landscapes and people. Midway through the month bad news came in the form of a hurricane. It was the largest the island has ever experienced. I could no longer celebrate my success. I was too busy worried about the well being of my family and friends. Are they safe? Are they alive? In the first few weeks following the hurricane, our days were spent reaching out to loved ones and doing what ever we could from over seas. Whether it was raising money or donating small items. It was during a deep conversation with a good friend of mine, a Boston Police Officer by the name of Jorge Dias, where we were speaking about the current state of Puerto Rico at that time and how the media was going about covering the stories. We both agreed that we craved to see pictures or videos showcasing something other than a flooded house. We were fully aware of the damage that was done but we just wanted to see something that gave people hope. A picture or a story that would remind us all just how strong the Puerto Rican community is and how they (we) will always make it through the storm. Jorge agreed to fund the project if I was up for the task. Before I knew it I was planning my next trip/project. November 21, 2017- I usually sleep during plane rides but I couldn't seem to relax my mind on this trip. This was by far the most nervous I've ever been on one. Not because I feared something going wrong with the plane itself but because I did't know what was waiting for me when I landed. By this point I had seen weeks worth of images/footage of the damage done on the Island but I knew it was going to be different seeing it with my own eyes. I had been mentally preparing myself for days because I knew I wasn't going back to the same Puerto Rico I had just experienced earlier this year. A lot was going to be different now. I remember arriving at the airport in San Juan and looking around for signs of a disaster. Maybe it was ignorant of me but I wasn't sure what to expect at this point. I received the same warm welcome from my two previous trips as I met my uncle outside, who greeted me with a joke and a smart remark, as he always does. Everything seemed normal. We were on our way to his house when I suddenly saw it, there it was... the signs of the hurricane. There was trash and debris all along the roads. Electricity poles were at eye level and trees were ripped out by their roots. Because there wasn't any light in the city, every intersection on our way home was a free-for-all. It reminded me of past trips I've had out of the US where the traffic laws were less enforced. It almost didn't feel real. It was movie like. I couldn't believe what I was seeing. The further we drove from the airport, the more I felt separated from the life I left behind in Boston. I knew these next 4 days were going to change me in ways I could not yet imagine. Upon arriving at my families home later that day, in Trujillo Alto, the first thing I noticed was the thickness of the darkness around me. I couldn't even see my hand in front of my face. My uncle passed me a headlamp, telling me I'll be needing it with a smile on his face. I got out of the car and walked towards my uncle's house to say hi to everyone, expecting to see all the familiar faces inside, but it was different this time because the house felt empty. Two of my cousins had moved to Florida with their wife and kids because the lack of power and schools being shut down made it difficult to survive for their family. I sat around in the dark for a while on my phone, checking in with everyone back home. My uncle apologized for there not being much to do and assured me we'd have power soon. He explained that because the generators run on fuel and fuel is expensive, and at times limited, they wait until around 10 pm to turn them on. This way they can at least sleep with a fan on, charge their electronics overnight or maybe watch a little bit of TV before bed. They would turn the generators off in the morning before heading into work. No one complained about it though, it was just the new normal. After bringing my bags into the house, I decided to sit outside my uncle's house to gather my thoughts before bed. While looking at the night sky, my 9 year old little cousin came to me and offered to make us both dinner. She said she was making tacos! I didn't give it much thought at the time and continued to count the stars. I could see her through the corner of my eye going in and out of my uncles house. She came back and jumped on the back of his pickup truck. She had a bottle of water and a brown plastic bag with her. I watched her for a bit, trying to make sense of it all. Once I realized what she was doing, I ran for my camera. 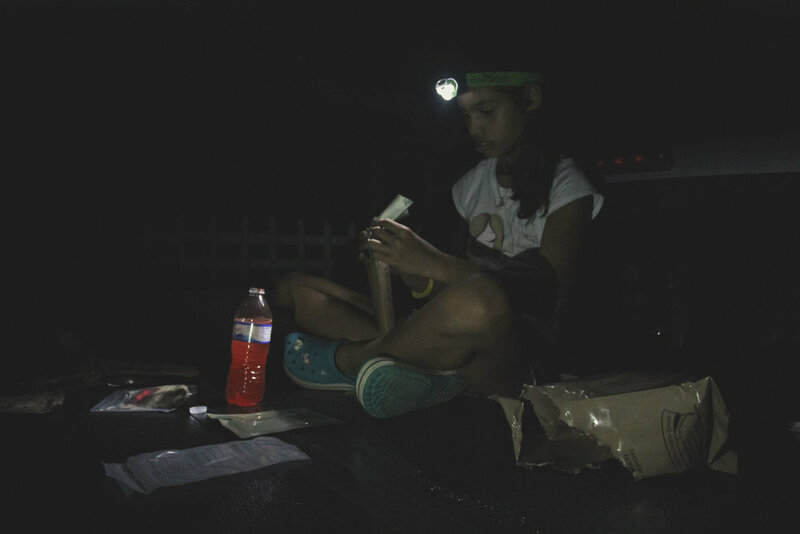 Here was a child preparing a MRE (Meal Ready-to-Eat) in complete darkness. That was the first time, as a documentary photographer, that I felt the need to take a step back and regain my composure. I wasn't documenting a stranger in a foreign land. This was my little cousin in a place that saw my parents grow up. What amazed me the most was that she wasn't complaining about her situation or the lack of electronics, as I imagined most kids in her place would. She was entertained and fascinated with the science behind cooking without fire. I started thinking about my last meal: a 3 piece value meal at Popeyes. I thought of all the fast food places I saw on my way there from the airport. I smiled to the best of my ability as I munched down on the easy-made taco. The taste and texture reminded me of public school lunches. Although my little cousin was eating it for fun, it broke my heart to know that this was the only option some families had to survive. How could this be possible? I couldn't believe this was the same place where I attended a feast just months before. If this moment was any indication as to what was to come, I knew this journey was going to be bigger than I anticipated. My older cousin and I sat outside a bit longer, discussing how life has been for them since the hurricane. He was telling me how government agencies have been distributing MREs throughout different neighborhoods around the island. He laughed about how he only eats the pastries, like the corn muffins or cookies, and has yet to try the mystery meat. I didn't blame him to be honest. I started to share my plans for the next four days with him when the lights in my uncle's house suddenly came on. I figured it was around 10pm, and decided to make my way inside to settle down for the night. There was a bed in the living room area with my name on it. My family was kind enough to buy new bedsheets and a pillow for me. It warmed my heart knowing they went out of their way to comfort me after going through so much themselves. For that I was grateful. There was an extension cord in the middle of the room that was connected to the generator outside. I used it to charge my cellphone and laptop while I jumped in the shower. I remember standing under the cold water for a while, processing all I had seen and heard that day. I had only been on Puerto Rican soil for less than 8 hours and I was already starting to doubt myself. I wasn't sure what to think or feel anymore. How am I suppose to bring back hope with me? I released my tears of frustration and sadness because it was becoming a challenge to stay emotionally balanced at that moment. I couldn't let them see me cry, after all, I would be going home before the end of the week but not them, they'll would be staying behind with limited electricity and harsh living conditions. I knew had to stay strong, not only for myself, but for the cause. The next four days weren't going to be easy to digest but I was there in search of the light at the end of the tunnel. On a mission for images that'll show the world we will recover as a people, as a culture and as an island. I went to bed on day one knowing my presence there was important. I knew I was living history, I had found my purpose. I originally planned to do one BIG post when I returned. But after reviewing all my images and reflecting on my experience in Puerto Rico, as a whole, I feel it's best I present my work in segments (photo-essay format). I want to give certain moments their own individual time on stage. With that being said, this is post 1 out of 5. I hope you'll be back soon for more!